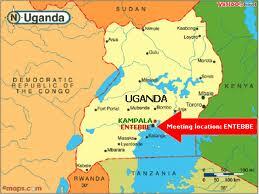 What do you think of when I mention Uganda? If you’re like many of the people who I spoke to before I left, you think of the Ebola virus, Idi Amin and some war that’s being waged. The reality of present-day Uganda should bring to mind a colorful, lush landscape with one of the most diverse populations of birds and mammals in the world. With more than 1000 species of birds, 342 species of mammals and more than 10 species of primates (including our next of kin the chimps and gorillas), Uganda sits the Great Rift Valley near the origin of mankind. Idi Amin is dead, and has not been in Uganda for more than 25 years so it’s time to update your imagination. Below are some helpful photos that I took today in the Botanical Garden in Entebbe. I leave tomorrow for the Budungo Forest and will continue to post more in the next two weeks. We saw a family of Colobus Monkeys playing with the young ones jumping off a large tree and then eating leaves in a nearby bush. Clearly they saw this as a game as their father stood watch. We saw more than 20 species of odd birds, including Ibis, Grey Kestrel, Grey Parrots, Weavers bathing in a stream, and Horn Bills who kept sweeping over us with wings sounding like a stalled car engine. Then there were the many other bright orange and red birds, iridescent grackles and tiny slow-motion hummingbirds that I couldn’t identify. At one point we walked into a vortex of bird songs whose chorus continued until we pulled ourselves away 15 minutes later. I believe they were celebrating the suddenly bold mid-afternoon sun. Next time someone mentions Uganda you should think of a lush landscape of deep red roads, gorillas and chimpanzees, storks sitting on the roof, monkeys and prehistoric birds joining a chorus of afternoon sounds. 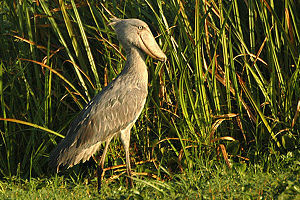 If you want one image take away, make it the Shoebill, a strange prehistoric bird related to the Pelican shown in the photo at the top of this post. Though I haven’t spotted him yet, he is on my list and I know I will see him by the end of my journey.